As a property manager, you know how important it is to be creating fresh content for your audience to consume and enjoy. What you might struggle with, however, is coming up with new ideas to keep your audience engaged week after week. Idea #1: Share the history and origin story of your property. Help people understand why your property exists, and what makes it special. Idea #2: Share photos or stories of your property being built. You could also show progress being made on current renovations or updates being made to your property. Idea #3: Share spotlight stories of the employees who work for you. Make it easy for people to feel like they already know the people they will see once they stay at your resort. Idea #4: Share interesting or unique stories about the history and evolution of your property. If your resort is new, feature stories about your favorite guests. Idea #5: Share a list of the most popular reasons why guests decide to stay at your resort over other options in the area. Idea #6: Share a bucket list of things that guests need to do or experience while they are staying at your resort. Idea #7: Share regular stories or updates from the owners of the property. Be transparent and open with current and future guests. Idea #8: Share recaps about events or conferences that were hosted at your property. Include photos, videos, and slideshows. Idea #9: Share information about your rooms and your buildings. Help people understand what makes your property unique. Idea #10: Share the embedded versions of previously recorded Facebook Live sessions with your readers. These Facebook Live sessions could feature Q&A’s with you, your team, other business owners in the area, your guests, travel blogger influencers, etc. Idea #11: Share stories about the vendors who help keep your property stocked and ready for guests. Again, focus on the power and value of transparency and storytelling. Idea #12: Share photos, videos, and stories of your guests and employees celebrating major holidays while at your property, such as Christmas, New Year’s, the 4th of July, etc. Idea #13: Share a list of common FAQs that you get from people who are preparing for a stay with you. Idea #14: Share information about any nonprofits or causes your business supports with the help of funds from guests. Idea #15: Share specific information and photos about the type of food guests can eat both on the property and off the property. Idea #16: Share ‘blog takeover’ sessions from travel bloggers and influencers that get invited to stay at your property. Idea #17: Share a calendar or list of upcoming events that will be happening at your property each month. Idea #18: Share throwback photos of your resort throughout the years. Focus on a different theme every month, such as: guest fashion, popular attractions, what meals looked like, room decor, etc. Idea #19: Share guest posts written by your employees that focus on topics related to their roles (ex. What goes into keeping up with the landscape every week, how the kitchen is managed, etc.). Idea #20: Share photo and video tours of your resorts in every different type of season. Idea #21: Share a post about the best food that travelers can get in the area. Segment the list based on food type, cost, distance from the property, etc. Idea #22: Share stories about other local business owners in the area. Help travelers get excited to meet and see the locals. Idea #23: Share a calendar of upcoming local events and festivals that your guests can experience during their stay. Idea #24: Share interesting facts about the area, both historical and current. Idea #25: Share recommendations on “non-touristy” restaurants, bars, shops, and entire areas of the city that travels can enjoy during their stay. Idea #26: Share a post that explains what your local area is known best for (types of food, quirky attractions, causes, historical markers, natural wonders, local business, etc.). Idea #27: Share travel lists that attempt to attract people to your area (ex. 22 Best Things to Experience When to Travel to ______). Idea #28: Share a blog post that outlines what the perfect vacation to your area might look like for different types of people. For example, what is everything a young family should do when they visit? What about newlyweds? A retired couple? Idea #29: Share guest posts from other people who have recently visited your area or stayed with you. Ask them to share photos and stories of their experience, detailing what they liked, offering tips for future travelers, etc. Idea #30: Share a post about the best local gifts to buy while you’re in town. Feature different local retail shops and items that are unique to your area. Idea #31: Share a blog series that offers readers ideas of different types of day trips they could take while staying at your property. Idea #32: Share a blog series that features photos you take of interesting places around the area. Idea #33: Share a blog post that details how your city differs from other popular cities nearby. Help your readers make the right decision about which city to ultimately visit and explore. Idea #34: Share tips and tricks for traveling to your local city. It could include driving recommendations, parking recommendations, or other tips that will help travelers have an easier time creating experiences in your area. Idea #35: Share a list of things that visitors can do for free in your area. Idea #36: Share a list of things that visitors could experience during every season of the year. Idea #37: Share a list of places that people can go to do various things you know they’ll want to do while they are staying with you (ex. best places to take a hike, best places to get a massage, best places to hear music, best places to get a glass of wine, etc.). Idea #38: Share a list of FAQs about your area that you regularly hear from your guests. Idea #39: Share tips about traveling to your area from other past guests. Before they check out, ask your guests to share with you the favorite things they did, what they wouldn’t do again, etc. Share this value on your blog to help your future guests. Idea #40: Share links to other articles and blog posts that have been written about your area by popular travel bloggers and major publications. Idea #41: Share tips on how to travel across the country in a car with young children. Idea #42: Share tips on how to travel on airplanes and through airports with young children. Idea #43: Share a blog post that compares the average costs of vacations in different areas of the country. Idea #44: Share tips on what types of items your future guests need to pack in order to be prepared for a vacation in your area. Idea #45: Share a blog post that offers tips on how to save money on airline tickets, car rentals, and other expenses relating to travel. Idea #46: Share a blog post that helps travelers understand how to save a budget for their dream vacation. Idea #47: Share unique and entertaining travel stories that you collected from past guests and from the people who follow you on social media. Idea #48: Share tips on how to travel with pets. Idea #49: Share a list of the top 50 must-read travel tips every person needs to go through before embarking on a trip. Idea #50: Share photos and videos of guests who agreed to document their journey on their way to your property. Idea #51: Share tips on how to travel with and vacation with your in-laws or extended family members. Idea #52: Share checklists that your future guests can use as they work to prepare and pack for their upcoming trip. Idea #53: Share custom music playlists that travelers can listen to while they are making their journey to your property. Idea #54: Share book recommendations for travelers to consider as they pack for their trip. Idea #55: Share a list of the biggest mistakes people make when traveling and offer recommendations on how to avoid or overcome them. Idea #56: Share tips on how guests can best travel from your property to other popular destinations and attractions in the surrounding area. Idea #57: Share links to other articles and blog posts that have been written about traveling to your area, or general travel tips posts that you think your audience could benefit from reading. Idea #58: Share a blog post that highlights the most common unexpected costs that travelers will have to deal with while on a trip. Idea #59: Share a blog post that offers tips about what travelers can do to keep their homes and valuables safe while they’re away on their trips. Idea #60: Share a blog post that features podcasts about traveling that guests can listen to as they plan their next trip. Idea #61: Share stories that your guests shared with you about their trip before they left. Idea #62: Share photos of guests enjoying their time at and away from your property during their trip. Idea #63: Share guest posts from loyal guests. Ask guests to takeover your blog and write about why they keep coming back year after year. Idea #64: Share examples of popular day trips that your guests decided to take while staying with you. Idea #65: Share a fun blog post series that features ‘Lost & Found’ items that have been left unclaimed by guests over the years. Idea #66: Share videos that guests take while at your resort or while exploring the surrounding area. 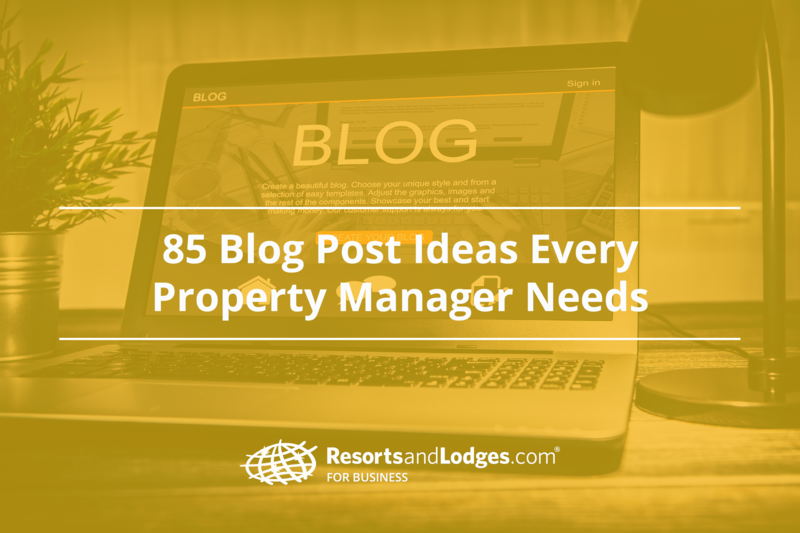 Idea #67: Share a blog post series that includes testimonials from guests who enjoyed their trip and loved staying at your property. Idea #68: Share a blog series of ‘Places to See & Things to Do’ that you compile from the conversations you have with your guests. Idea #69: Share a blog post series that features one of your guests every month. Do a Q&A-style interview to help interested travelers understand who stays at your property and why. Idea #70: Share the results of a survey that you send out to guests each year. In your survey, ask past guests various questions about their trip, their experience at your property, what they did while they were in the area, what they wish they would have done but didn’t have time for, and any other feedback they might have that could be beneficial to your future guests. Idea #71: Share professional-grade videos of your resort and the surrounding area. Idea #72: Share high-quality photos of your resort and the surrounding area. Idea #73: Share photos and videos that guests have given you permission to use. Idea #74: Share infographics that relate to travel and vacation. Idea #75: Share GIFs that offer quick travel tips for your guests. Idea #76: Share interactive maps that help future guests become more familiar with your resort. Idea #77: Share your Facebook Live video sessions by embedding the code directly into a blog post. Idea #78: Share audio snippets of interviews you did with guests or business owners in the area. Idea #79: Share custom music playlists by embedding them directly into your blog posts from Spotify. Idea #80: Share high-quality, bird’s eye view footage of your property that you recorded using a drone. Idea #81: Share a new contest of giveaway that you want to promote to your audience. Idea #82: Share new packages that you created in order to drive more reservations. Share special, limited-time only offers that you want your audience to see. Idea #83: Share fun, unique marketing campaigns and collateral that you’re using to promote your property. Idea #84: Share year-end campaigns that promote your property and drive your audience to book reservations with you before January 1st. Idea #85: Share storytelling collateral about your guests, your employees, and your property that you intend to bake into bigger, theme-based marketing campaigns for your property. What topics perform the best on your blog? Tell me in the comments below.